The Radiological Society of North America (RSNA) held its 90 th Scientific Assembly and Annual Meeting in Chicago, IL, November 28 through December 3, 2004. Nearly 59,000 people attended the gathering, including more than 26,400 imaging professionals. The meeting offered more than 2000 scientific presentations and poster papers. In addition, more than 600 companies displayed products in the technical exhibit area. The following highlights just a few of the new products shown at RSNA 2004. 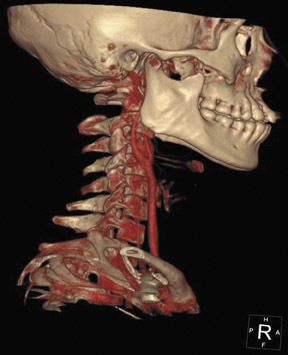 Toshiba America Medical Systems, Inc. (Tustin, CA) featured a variety of new products in a range of imaging modalities. From its magnetic resonance (MR) imaging line, Toshiba highlighted enhancements made recently to two of its products: new gradient packages for the Excelart Vantage 1.5T system (Figure 1) and Version 5.0 software for the Ultra open-MRI system. The new gradient packages, the Vantage MGV and the work-in-progress ZGV, feature gradient strengths of 30 mT/m and 33 mT/m (milliTesla per meter) and slew rates of 86 mT/m/sec and 200 mT/m/sec (milli-Tesla per meter per second), respectively. 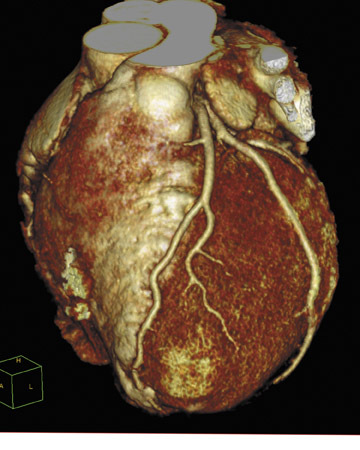 This Excelart Vantage system is capable of performing a variety of advanced MR imaging applications when equipped with optional packages for cardiac imaging, advanced echoplanar imaging (EPI), perfusion and diffusion imaging, peripheral MR angiography (MRA), and SuperFASE (fast advanced spin echo) imaging. The system also features the company's proprietary Pianissimo technology for acoustic noise reduction and SPEEDER parallel processing for increased imaging acquisition speed and reduced examination times. The Version 5.0 software for the Ultra open-MRI system includes advanced MRI pulse sequences for added clinical versatility and faster scan times. The system features an amplitude of 25 mT/m and a slew rate of 100 mT/m/sec. According to the company, this slew rate allows the system's gradient speed to be nearly 5 times faster than current open systems and 250% greater than its high-field (1.0T to 1.5T cylindrical) counterparts. With the new Version 5.0 software package, the Ultra can perform a variety of MRI pulse sequences, including: SuperFASE, steady-state 2 echoes (SS2E) for high-contrast imaging, steady-state T2 (SST2) for conducting heavily weighted T2 images, sliding slab for enhanced three-dimensional (3D) time-of-flight (TOF) brain MR angiography images, variable no phase wrap (NPW), line scan diffusion to complement sin-gle-shot echoplanar imaging (SS-EPI), and swirl encoding to reduce flow and motion artifacts. The company also used RSNA 2004 to introduce the Aplio xV high-performance ultrasound system and the addition of 4-dimensional (4D) imaging technology to its Nemio compact system. 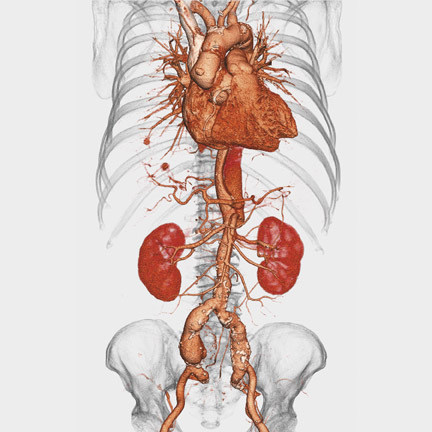 According to the company, the Aplio xV features "next-generation tissue Doppler and contrast imaging technology based on Toshiba's Intelligent Component Architecture (ICA) to allow faster processing of more complex data" for improved image quality and sensitivity. Designed for small hospitals and physicians' offices, the Nemio (Figure 2) is now capable of performing simultaneous display of real-time 2dimensional (2D) images and continuously updating 3D volumes. Additional enhancements include: Tissue Harmonic Imaging (THI); Quad Signal Processing (QSP), which provides 4 times more data per transmission signal; Directional Color Angio that combines color angiography with directional flow data; and multifrequency transducers including convex, linear, and sector transducer capabilities. The system also features optional software packages designed specifically for the clinical requirements of a particular imaging marketing segment. The radiology package features trapezoid imaging; an extended-field-of-view mode; a differential THI option to provide increased resolution at depth to assess tumors, lesions, cysts, and normal tissue with maximum penetration; a Quick Scan option for one-touch image optimization; and the ApliPure option for real-time spatial and frequency compounding. The system also features a new flat-screen display for enhanced imaging uniformity and clarity. 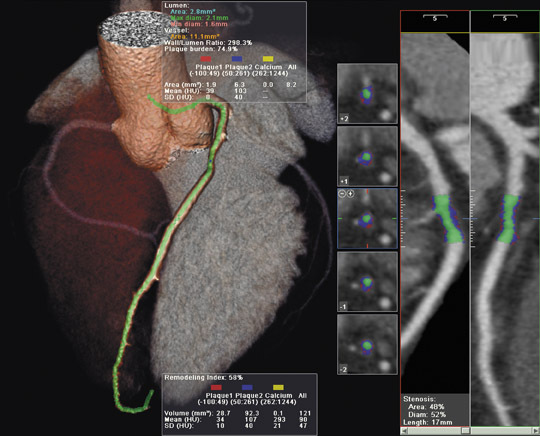 In the area of computed tomography (CT), Toshiba announced the approval of the SUREPlaque cardiac visualization software. Designed for the Aquilion CFX line of scanners, this new software can be used to identify and quantify soft plaque for cardiac and peripheral vessel analysis using a color-coding system based on tissue density. The company also displayed, as a work-in-progress, a new large-bore CT scanner designed specifically for oncology. The Aquilion LB features a 90-cm bore with an 85-cm display field-of-view and a 70-cm acquired field-of-view. The system's Quantum multirow CT detector provides image slice thickness of 0.5 mm. According to the company, the detector's highly efficient ceramic material provides low noise and high dose efficiency. The company hopes to have this system available in the third quarter of 2005. Lodox Systems North America (South Lyon, MI) featured its new Rad-MP system upgrade for the Statscan Critical Imaging System. Designed for use in emergency and trauma medicine, the Statscan system is capable of performing a whole-body X-ray examination in approximately 13 seconds. Once acquired, the images can be displayed, magnified, and rotated almost immediately at a viewing station. The new upgrade consists of a 20-× 28-inch (50-× 71-cm) radiolucent imaging table and a hydraulic patient imaging chair and platform. 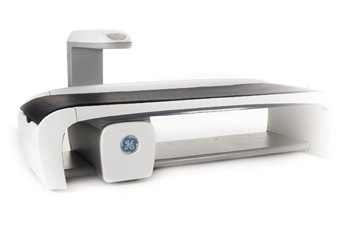 The imaging table can be used in both horizontal and vertical planes, and the adjustable hydraulic chair and platform can accommodate both seated and standing patients for upper-body, extremity, or erect chest/abdominal imaging, as well as for weight-bearing spine and joint procedures. The Rad-MP system upgrade can be purchased as an option to the standard configuration on new Statscan systems or added to Statscan systems already in clinical use. Confirma (Kirkland, WA) previewed two works-in-progress at RSNA 2004: the new Access Breast Coil and the latest version of CADstream. The Access Breast Coil is a 7-channel phased-array coil designed for both conventional imaging and interventional procedures (Figure 3). Optimized for parallel imaging of the chest wall, breast, and axillary tissue, it supports both bilateral and unilateral imaging. For interventional procedures, the coil's design allows for lateral, medial, and craniocaudal access, and it supports all needle-gauge sizes and vacuum-assisted biopsy systems. In addition, the coil has an integrated lighting system for illumination during interventional procedures. The ergonomic design was modeled after stereotactic biopsy tables with positioning accessories that include a headrest, armrest, and torso pad to relieve pressure on the sternum. The company expects to have the Access Breast Coil on the market in the first quarter of 2005. Confirma also previewed the latest version of its computer-aided detection (CAD) system for breast MR imaging, CADstream, at this year's meeting. The new version incorporates the American College of Radiology (ACR) BI-RADS Atlas for lesion classification. The system also has a multimodality-ready configuration, offering users the ability to access, view, and reference mammography and ultrasound studies while interpreting breast MRI with CADstream. The system's additional new features include automated summaries with size, classification, and location for tumor volume of interest, and AngioMap overlays. Also at RSNA 2004, Zonare Medical Systems, Inc, (Mountain View, CA) introduced the z.one convertible ultrasound system based on the Zone Sonography platform. The Zone Sonography platform employs a new approach to ultrasound data acquisition and image formation. According to the company, this technology allows for the acquisition of data in relatively few large zones rather than many narrow lines used in traditional systems, allowing for more rapid image storage, processing, and display. Unlike conventional ultrasound systems in which each line is formed by summing together the contributions of all the channels in the transducer and discarding the channel data as soon as each line is formed, Zone Sonography aggregates the original channel data and stores it in Channel Domain Memory. All of the echo information is then utilized in Channel Domain Processing to form the image and to provide greater options for image postprocessing by retaining all of the original raw data. This new method of data acquisition is used in the company's new z.one convertible ultrasound system, a full-featured cart system that can quickly convert into a compact, portable system that works like a conventional system (Figure 4). The z.one system consists of a full-featured cart-based system and a compact system. The cart system includes an adjustable height cart, advanced LCD display, and a backlit keyboard and a full user interface similar to that on a conventional ultrasound system. The convertible scan engine is contained in a self-enclosed, 6-lb compact unit that can be removed from the cart and transported to the patient. Full functionality is available in both configurations, including advanced imaging and multiple simultaneous modes. The company expects the system to be commercially available in early 2005. DynaWell Int. AB (Billdal, Sweden) featured its L-Spine compression device for CT and MR imaging. The device was designed to simulate the axial compression that occurs on a patient's lumbar spine when standing in order to aid the clinician in detecting abnormalities that might not be visible when the spine is relaxed in the supine position. In clinical use, the patient wears the DynaWell L-Spine vest over his or her shoulders and upper chest with the feet placed against the footplate of the compression device (Figure 5). The straps on the vest are tightened over the patient's chest and two adjustable cords on opposite sides of the vest are attached to the compression device. By tightening the cords to a desired measured load (up to 50% of body weight), the clinician is able to compress the spinal cord in a way that the manufacturer states is similar to that of upright posture. In addition, it helps the patients remain motionless and distributes the pressure across the chest rather than the shoulders. According to the company, this noninvasive device can be used with nearly all CT and MR systems and is most useful in patients with neurogenic claudication, sciatica, and long-standing, unexplained lower back pain. Agfa (Mortsel, Belgium) also featured a variety of products at RSNA 2004. One highlight for the company was the launch of their new multimodality mammography diagnostic workstation, the IMPAX MA3000. This system, developed based on the company's picture archiving and communication system (PACS) model of information management, allows the user to access all digital breast images as well as all other general imaging studies, regardless of the modality used to acquire them, all on a single workstation. The workstation comes with full integration capability with PACS, radiology information systems (RIS) and hospital information systems (HIS), and reporting applications. When part of a PACS network, images can be retrieved and reviewed from anywhere on the network. In addition, Agfa announced the release of the latest version of its voice recognition technology, TalkStation 3.0. The new version incorporates several workflow and user interface enhancements, as well as the Dragon Naturally-Speaking v7 medical speech engine from ScanSoft, Inc. (Peabody, MA). TalkStation 3.0 also features: Correctionist Capabilities, enabling real-time speech recognition with on-the-fly deferral to a transcription editor; TeleDictation, for dictating via telephone; Auto Macros, for additional workflow customization; Enterprise Gateway for increased interface flexibility; and several security enhancements. The company also introduced two new computed radiography (CR) digitizers: the CR 75.0, a high-throughput CR system for centralized CR environments, and CR 25.0, a multiapplication digitizer for a decentralized environment (Figure 6). According to the company, the CR 75.0 is a high-speed multiuser digitizer, which features a drop-and-go buffer designed to eliminate waiting times and allow for a continuous workflow. The company calls the CR 25.0 a fast, highly versatile, small-footprint digitizer. Designed to complement existing centralized CR systems, the CR 25.0 can be used inside the X-ray room and is suitable for a mobile environment as well. A fully integrated CR User Station is available for both CR 75.0 and CR 25.0 digitizers. Both systems also offer 3 different resolution modes with a standard resolution of 6 pixels/mm that can be increased to 10 pixels/mm and a maximum resolution of 20 pixels/mm available for specific applications. "This new technology platform allows us to provide increased, homogeneous application range throughout the entire Agfa range of CR systems, to tailor specific CR solutions to different and new imaging environments, and to address the increasing needs to be closer to the patient point of care," said Iskandar Accaoui, Business Manager Digital Radiography Solutions at Agfa. Technology and Industry: RSNA review. Appl Radiol.